A drunken mourner kneed a police sergeant in the groin after his grandad’s funeral and then tried to assault the officer again at the custody office, a court heard. Burnley Magistrates’ Court was told how Christopher Charles Grieve (23) was arrested when his family called the police after the wake. The court heard Grieve had the chance to apologise to his victim, Sgt Nigel Hindle, who suffered soreness, at the police station. But, rather than say sorry when he had the chance, he asked which officer it was he attacked and when Sgt Hindle told him: “me,” the defendant then attempted to kick him again. The hearing was told Grieve, said to have been “extremely close” to his late grandfather, had had at least 10 pints of lager and some shots and Jager bombs. He had no previous convictions, but had three fixed penalties for being drunk and disorderly, the last in October 2015. 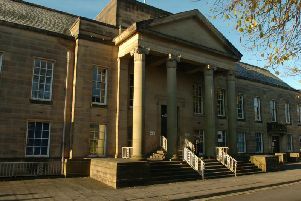 The unemployed defendant, of Thursby Road, Nelson, admitted being drunk and disorderly in Skipton Road, Colne, and police assault on January 19th. He was fined £120 and ordered to pay £40 compensation to the officer, £85 costs and a £20 victim surcharge.